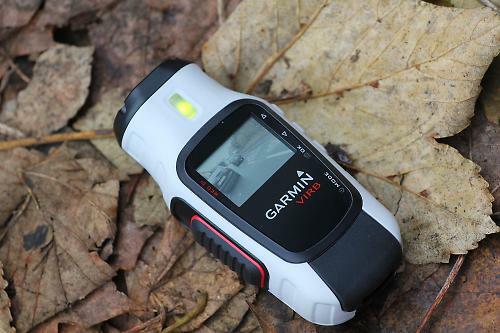 The Garmin Virb Elite is Garmin's answer to the GoPro Hero. Sort of. It's a different approach with some unique features, and if you specifically want to capture your rides, with data, then this is the probably camera for you, assuming you can justify the outlay. In the box you get the camera itself and a couple of sticky mounts, designed to be adhered to a helmet, snowboard, car bonnet or wherever else you fancy. 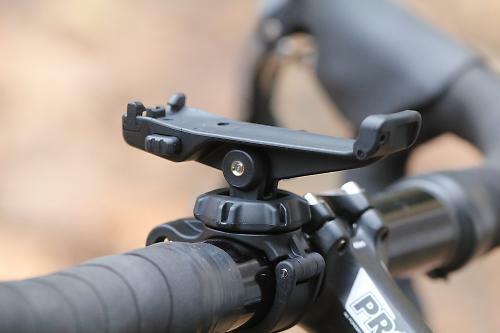 A bike handlebar mount is extra, but definitely worth considering if you're intending to shoot vids mostly from two wheels. You can also get a harness mount that puts the camera on your shoulder. That's more for skydivers and snowboarders and the like but can also be used on the bike; you get less bumpy footage than from the bars and the video doesn't swing away every time you move your head. You do look a bit like the Predator though. The hardware is a different spec to that of the GoPro and other mountable cameras like the Nilox – it's a chunkier system and it feels solid in use. There's a Garmin-to-GoPro adapter that allows you to use your existing mounts, if you have some already. Out of the box the camera is IP67 water- and dustproof, meaning that if you drop it in a puddle there'll be no ill effects, so long as the puddle isn't over a metre deep and you don't leave it there longer than an hour. A rubber cover protects the micro-HDMI and mini-USB ports to the rear; they're waterproof anyway but the cover stops crud getting into them, so make sure you secure it. You can use the Virb underwater out of the box, although for better image quality Garmin suggest that you use the dive case if you want to shoot at depth. The waterproofing in the unit is more about being able to leave it on your bars on a rainy ride. 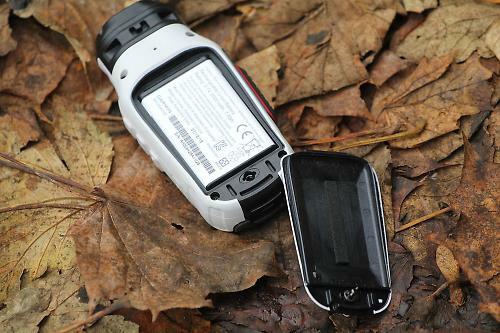 The battery is interchangeable, so if you're planning a long ride you could take a spare if you wanted. It mounts via a door in the base of the camera, and the mini-SD card goes in there too. On the side of the Virb there's a big sliding record switch, and on the other side a power button and three function buttons. On the top face you get an LCD screen. It can display a range of data, plus you can use it as a viewfinder to frame your shot. It isn't backlit and the colour reproduction isn't great, but it's fine for framing a shot or reading your stats when it's light out. The main USP of the Virb Elite is that the camera contains a GPS chip and is ANT+ enabled. That means you can link it up to your HRM, power meter and speed-cadence sensor and record that information, along with your route, in a GPX file. The camera records the GPS location whenever you're filming, too. The upshot of all this is that you can import all your data into the Garmin Virb Edit software and make a cut of your ride that includes the GPX information overlaid on top. So, you get a wiggly line showing your route and the choice of a number of different data displays from simple number stats to tachograph-style needles and the like. As well as the ANT+ data the Virb Elite has an in-built barometric altimeter which is a definite plus for ride data recording. The camera has video settings from high definition 1080p/30 through 960p and 720p, both of which you can have at 60 frames per second. There's a slow-motion setting (120fps) but only at 480p resolution, and you can also set the camera to time lapse in increments up to a minute. Still photographs have a maximum resolution of 16MP and there are a number of lower quality options there too. One of the nicest things about the Virb Elite is how easy it is to record. There's a big sliding toggle switch on one side: forward is record, back is stop. It's simple to use, easy to check when you're recording and you can find it in thick winter gloves. If the camera's not switched on when you hit go the camera will still record, but there's a lag of about six seconds while it sorts itself out. The Virb Elite is Wi-fi enabled too, and you can use the Virb app on a smartphone or tablet to control it. That's more of a plus when you have the camera set up in an inaccessible location than if you have it stuck on you bars. If you're filming your mates from the back of your bike you can check the framing with a live feed to your phone and hit record at the right time, for example. The Wi-fi connection persists over quite a distance so you can set up the Virb somewhere, turn it on with your phone and ride past it for some off-the-bike footage to cut into your epic. 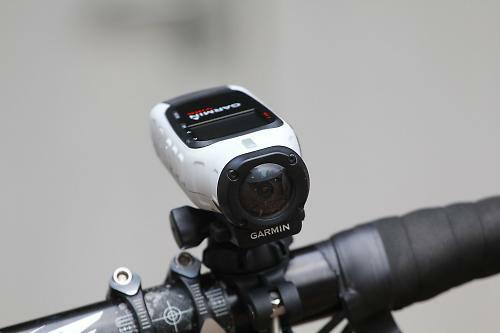 You can also control the Virb Elite via another Garmin device such as an Edge computer, or with the dedicated three-button ANT+ remote available separately. There are a couple of features that are useful if you're into a range of sports, that aren't specifically tailored to cycling. The Virb contains accelerometers that can give you a G rating to stick onto your vids, which might be fun on the track. It also has a mode which switches recording off when you're ascending (the Virb Elite has a built-in barometric altimeter) and then starts again when you're heading down the hill: great for skiing or an uplift day on your downhill mountain bike. The Virb is different from any other camera I know of in that you can also use it to record your ride and display that data, sort of as you would with a dedicated GPS. It's not as configurable, and the screen isn't as good, but if you want to shoot your ride and you don't want to hang multiple units from the bars, the Virb will give you ride data as you go. Bear in mind that you're limited by the life of the battery, which is far shorter than you'd get from a dedicated GPS unit. None of this would be any good if the camera footage isn't up to scratch though. Thankfully we've found the footage that the Virb shoots to be of very good quality. Here are a few examples. Here's a selection of shots from our recent ride out to Urbino in Italy. It was a partly overcast day with some sunny intervals. The camera copes well with the changes in light, though sometimes it's overwhelemed by shooting against a grey sky and underexposes a bit. The shots from the bar mount aren't too bumpy, even though the roads in that part of Italy aren't the greatest. The Virb's digital image stabilisation was turned on and it does make a noticeable, if minor, difference to the footage. This first test reel includes some night footage, which is dark (natch) but clear; the camera doesn't struggle to keep up the required frame rate even in low light conditions. This commute footage is exported from Virb Edit, and shows one of the possible overlays with speed and heart rate as well as a few other fields on the left, and a plot of the route from the GPX on the right. If you're recording a sportive or day out, this allows you to tie in your video with your position on the route, which is a nice feature. Another overlay, this time from a race at Odd Down circuit in Bath. You can get a good idea of the wide field of view from close race footage such as this, and again the overlay can be used to show the data you've pulled from the GPX file on the Virb. This footage of the Southampton Uni CC pursuit team is shot at Calshot velodrome. The camera struggles a little bit with the light levels and the white balance inside the track, but the footage is still decent quality and it would be very useful for ironing out problems with positioning and changeovers,for example. Here's an example of the 120fps slow motion footage, shot to record the end of a race at Odd Down Circuit. It's only available in 480p resolution but the quality is good enough to strip in to a higher-quality vid in short bursts. The Virb Elite will also record timelapse at up to a minute-per-frame intervals. This is Joel's (he's six) holiday project of sticking some blackberries in the window and watching them rot over the course of a week. You might be able to think of a better application. Overall the footage is comparable to many of the cameras out there, but in terms of resolution and image quality it's not a match for the higher-spec GoPros, for example. If you're looking for a tool to capture action as part of a wider production, and especially for broadcast, that's still the benchmark. If what you want is a tool to document the stuff you do, and your editing ambitions are a step below that, the Virb Elite makes a lot of sense. It's waterproof out of the box, the footage is good, it can capture a wealth of other data to overlay on top, the battery life is better than most cameras (and you can carry a spare), the mounting options have everything you need for pretty much any sport, you can control it wirelessly and you can even use it as a bike computer. That's a lot of pluses. What are the downsides? Well, there's no getting away from the fact that it's an expensive toy at £350 for the Elite package. The standard Virb you can have for a lot less. That loses the GPS chip though, which is a fairly big part of what makes the Virb Elite such a rounded package. If you're recording your ride via GPS you can still use a GPX file to sync up your footage in Virb Edit using time codes, but that's more work and the simple editing process is part of the appeal. The standard Virb doesn't have WiFi either so you can't use the smartphone app to control it; that's less of a loss overall. It's quite bulky for an action camera – though not the biggest – so if you're just looking to get footage of your commute it's not the best for helmet mounting. It's overkill for that kind of application anyway. 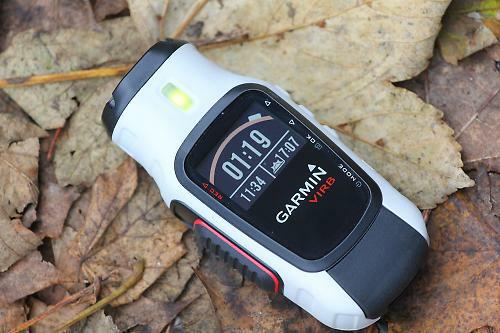 Both the Virb Edit software and the smartphone app feel at the moment like works in progress; that's sadly not uncommon for Garmin who seem to rush to launch a bit with loose ends untied at times. That being said, both apps have been updated since I've been testing the camera and they're a lot better, especially Virb Edit. It really needs a basic suite of simple transitions to spruce up your final vid, but generally it does a good job. 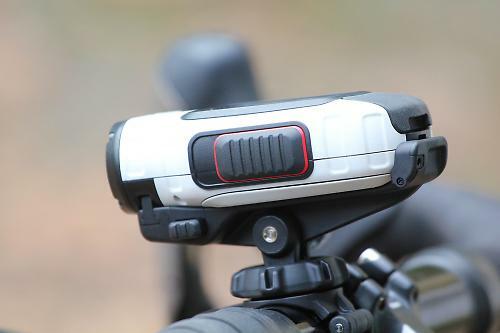 Overall, and considering the camera is in its first incarnation, the Virb Elite is a good package which is especially suited to cycling with its ability to connect to different ANT+ data sources. The Elite is more compelling than its cheaper sibling thanks to the GPS and WiFi capability, but you're paying a reasonable premium for those functions so if you feel you don't need them the standard Virb may be a better option. The unique selling point is the ability to capture other data and combine it in your edits. If you're not going to use that, then you can get cheaper cams than this that will shoot better footage. The VIRB Elite is a true HD 1080p action camera that combines enhanced HD video recording with Wi-Fi capability and advanced GPS functions like preset recording profiles. For example, the Ski profile automatically records during the run but pauses when you get to the bottom. VIRB Elite features a built-in 1.4' Chroma color display that stays on when the camera is on, but uses minimal power. The display lets you easily setup/preview/playback video and adjust menu settings without detaching it from its mount. Record at 1080p for up to 3 hours with the rechargeable lithium-ion battery. And video enhancement features like Digital Image Stabilization and Lens Distortion Correction ensure footage looks great, even before you start editing. VIRB Elite records true HD 1080p video that lets you relive every minute of your adventure in full, high-contrast, undistorted detail. In addition to 1080p@30fps, you can adjust resolution and filming speed for crisp, dramatic slow motion up to 120fps. And it's all processed through a 16 megapixel CMOS sensor so you get the highest quality video and a more manageable file size for editing and sharing. Multiple HD video modes: 1080p@30fps, 960p@48fps, 720p@30/60fps, 848x480@120fps. Why mash a button and hope you got the shot when you can set-up, preview and playback video on a built-in, full-color Chroma display? The 1.4" display on the VIRB is also your window into the menu settings. Check your shot before you leap, choose slow motion, or even switch between video and still photography. It's always on the screen and the screen is always on (but uses minimal power). VIRB Elite features a class-leading 2000 mAh lithium-ion battery that has been tested at nearly 3 hours recording at 1080p. Which means there's a good chance you'll tire out before the battery does. And with multiple charging options (sold separately) you'll have plenty of juice. Extend your filming time by carrying a replacement battery (sold separately) on your all-day adventure. VIRB Elite is equipped with Wi-Fi for wireless communication to your smartphone or computer. Wi-Fi enables you to see the image preview and adjust camera settings. VIRB Elite features high-sensitivity GPS for data stamping and GPS-based 'smart' recording profiles like Skiing Mode, which automatically records your downhill runs and stops recording while you're getting hot cocoa or waiting in the lift line. VIRB Elite's ANT+™ wireless connectivity also works with Garmin external sensors. Pair with the tempe™ wireless temperature sensor, speed/cadence bike sensor and the premium heart rate monitor to include revealing sensor information in your videos, like how fast your heart was racing on your last bike race or peering over the edge of the Grand Canyon. Elite also features a built-in accelerometer and altimeter for data stamping and custom filming profiles. VIRB Elite was engineered for ease-of-use with a large, instant record slider switch on the side of the camera. The slide and click of the switch makes it easy to know that you are recording, even if you're wearing gloves. The overall design of the camera is both sleek and rugged which helps you integrate VIRB into your activity without having to work around a bulky camera body. So go ahead and ski or zip-line or even bobsled knowing you got the shot (and maybe the best time). VIRB Elite uses ANT+™ wireless connectivity to enable you to use your compatible Garmin product like fenix™, Oregon® and Edge® as remote controls. With VIRB Elite, you also gain the advantage of Wi-Fi so you can stop and start recording wirelessly with your smart phone or compatible Garmin device. Now, you don't have to take your hands off the handlebars or remove the camera from the mount for that perfect shot. With the Digital Image Stabilization feature engaged, VIRB Elite adds a little stability to bumpy rides and adventures so you can share a smoother video with your friends. Plus Lens Distortion Correction (LDC) works to enhance the quality of your video, even before you start editing. VIRB Elite is a high-powered digital photo camera too. With 16 megapixel photo capture LDC plus a WideVü lens (Wide/Medium/Narrow) to make your photos sharper, clearer and less distorted. Shoot 16 megapixel, 12 megapixel, or 8 megapixel as a single shot (on-camera button or controlled remotely) or choose Photo Burst (6/s)or Time Lapse at various intervals. And it's all processed through a 16 megapixel CMOS processor for high quality images and more manageable file sizes. Don't lose a moment of video just to capture a photograph. VIRB Elite allows you to take still photos at the same time you are recording video with just a touch of the button on either your compatible Garmin device or on the camera itself. VIRB Edit is free desktop editing software that you can download to your computer for intuitive, robust video editing that takes advantage of all the VIRB Elite external and built-in sensor compatibility and compatibility with other Garmin devices. Include a dashboard with your speed and heart rate with your motorcycle video, or the accelerometer and altitude data on your sky dive. Once you have the video you want to share, upload it on to your favorite share sites for all your friends to see. The wide variety of VIRB Elite mounts allow you to firmly lock the camera in position, virtually anywhere. From curved and flat deck and dash mounts to handlebar, helmet, shoulder and multi-use strap mounts and more, VIRB mounts have you covered. Joints on VIRB mounts feature interlocking joints that grip in place instead of relying solely on tension. This provides a more rugged and durable, anti-vibration locking performance. We even offer an adapter that lets you use VIRB with other industry mounts. VIRB Elite is rugged and waterproof to (IPX7) right out of the box meaning the device will withstand incidental exposure to water of up to 1 meter in depth for up to 30 minutes. For all activities that involve water immersion, the optional Dive case is required. The Dive Case increases the waterproof rating to 50 meters and features a flat front lens for clear underwater imaging. It's not cheap, but you do get a decent package for your money. Ease of use, control options, video quality, software. Auxilliary buttons a bit small, display not great (but better than not having one). Would you consider buying the product? Yes if i could justify it, which I probably couldn't. Would you recommend the product to a friend? Well-heeled ones, yes. Feels a little bit like a work in progress at times but a good first incarnation that will probably get better. I don't get it, this camera is capable of making 1080p movies right? Sorry for the caps that follow: UPLOAD 1080p VIDEO'S! How can we compare this camera with Go Pro or other camera's if u don't let us see what it's capable of? Please upload those samples in 1080p and change them in this post. After that u can delete my post. Great review Dave, very detailed. I was totally with you on price, features, size, remote control - everything. Until I saw the image quality. First & foremost, an HD camera should be HD. Or look like HD. Or even come close. The very still shots of Italy, panning around the piazza look fine, but once you get moving it turns to early-2000's-era mobile quality. I'll wait until HD means HD. i'll pop some raw footage links in when i get a chance. The Gadget Show compared this with the GoPro Hero 4 last night. It came out very favourably except when it came to image quality which just wasn't quite so good. "Strictly no helmet or action cameras permitted, both for practice and racing. As per regulation 3.2.7, all equipment not essential for racing purposes must be removed". British Cycling rules required a marshal at a 4th Cat crit to make me remove a small stuffed toy Wyle. E. Coyote that was zip-tied to my helmet, and had been for nearly twenty years. My Mojo. Tens of thousands of miles together. Then it got lost at the side of the track. I hate BC, just because of that. And I will bring them down. One day. Anything that decreases that current pre-occupation with filming everything that ever happens ever, ever, ever, is a good thing. Terrible pic. quality for over 300 pounds really ?? Essential for video the moments before some truck mows you down and...errrr, that's it. Are bike/ski/whatever videos the modern equivalent of 70s holiday slide shows? Uncle Stan: "And here's another of Auntie Edith just boarding the plane..."
Before more Me-Too folks jump in bemoaning their personal objection to having to exercise the apparently exhausting option *not* to watch something, let's be clear: *you don't have to watch anything*. I really, really wish I had HD video footage of the six 70-90km/hr alpine descents I did last year. Sod anyone else, I want to go back there in my head once in a while. Also, the time lapse mode means you could cram a 4hr bimble around country lanes into less than a minute. 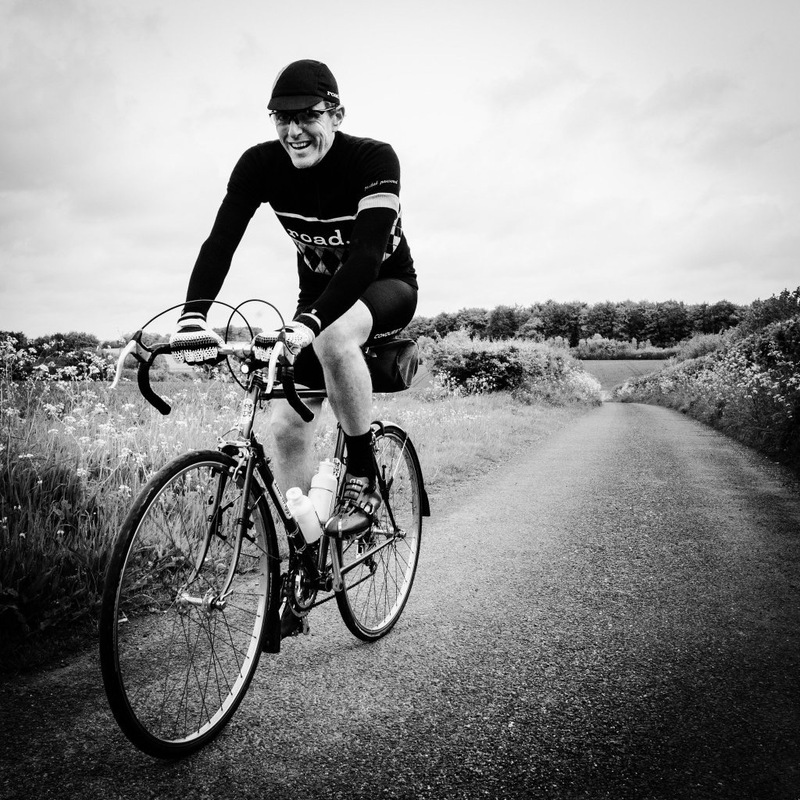 A great way to get others enthused about a route, or to join you next time. People can't believe how nice the North Hampshire Downs are, just 60 minutes from central London. Decent timelapse HD video would be a great marketing too for local rides and businesses. Decent timelapse HD video would be a great marketing too for local rides and businesses. The functionality is fine, but who wants something that big and ugly on their bars? The GoPro models are only marginally better in this regard. The design of the Shimano model is the first I would even consider hanging on my bike. I must confess that I find the whole concept of recording one's ride extremely tedious. 99% of your ride videos will tell the same boring story; once you've watched two or three of them you've practically seen them all, especially for road rides. Watch some on youtube if you must scratch this itch and save yourself some cash. Unless you are prepared to buy and attach 3 or 4 of them, at a cost probably in excess of a grand, the videos are spectacularly dull. You are left with no choice of camera angles, so absolutely no directorial control to add even a tiny amount of interest to your video. has anyone one experienced the poor battery life. The best I have experienced is 105 mins, even on timelapse this is attrocious. I bought this to record the highs, lows and fun of a week in the alps but gave up after day one as climbing for 2hours isn't covered by a single charge and a break spoils the flow of the playback. Either I am doing something wrong, the batteries are cheap or this is an expensive marketeers campaign for the unsuspecting but it now sits proudly swelling the side of the bag I bought to hold it. Can anyone tell me if they have one how much just using the delayed photo facility will affect battery life: for example it is said to have a 3 hour battery life for video, but if you set it to a photo a minute, will that extend the battery life or not? Did you have to change the battery on the time lapse of the rotting fruit for example? I was thinking of getting one to record a C2C [photo per minute] on a daily basis, which of course will mean a long time in the saddle and transferring and saving photos over night. Its a great camera, but there were clearly some daft choices made when it was being conceived! a pointless purchase for serious cyclists, I managed only a short time from the battery in all modes, which made the purpose of its purchase irrelevant. Can you imagine riding 7 of the big hills in the Alpes and being unable to capture anything beyond 2 hrs, even with a second battery I still lost the exciting descents..............marketeers have demanded too much functionality that is impossible to power, form over function in its purest sense. On a positive front though, the picture quality is excellent just not available for the fun bits.